Not to be confused with United States Numbered Highways or Interstate Highway System. Individual states are encouraged to focus federal funds on improving the efficiency and safety of this network. The roads within the system were identified by the United States Department of Transportation in cooperation with the states, local officials, and metropolitan planning organizations and approved by the United States Congress in 1995. The Intermodal Surface Transportation Efficiency Act of 1991 provided that certain key routes such as the Interstate Highway System, be included. The National Highway System Designation Act of 1995 (Pub.L. 104–59, 109 Stat. 568) is a United States Act of Congress that was signed into law by President Bill Clinton on November 28, 1995. The legislation designated about 160,955 miles (259,032 km) of roads, including the Interstate Highway System, as the NHS. Aside from designating the system, the act served several other purposes, including restoring $5.4 billion in funding to state highway departments, giving Congress the power to prioritize highway system projects, repealing all federal speed limit controls, and prohibits the federal government from requiring states to use federal-aid highway funds to convert existing signs or purchase new signs with metric units. The act also created a State Infrastructure Bank pilot program. Ten states were chosen in 1996 for this new method of road financing. These banks would lend money like regular banks, with funding coming from the federal government or the private sector, and they would be repaid through such means as highway tolls or taxes. In 1997, 28 more states asked to be part of the program. Ohio was the first state to use a state infrastructure bank to start building a road. An advantage to this method was completing projects faster; state laws and the lack of appropriate projects were potential problems. A map of the Strategic Highway Network, one component of the NHS. 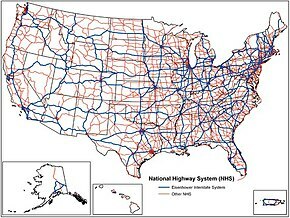 Interstate Highway System: The entire Interstate Highway System (which is also known as the Dwight D. Eisenhower National System of Interstate and Defense Highways) is included in the NHS, but retains its separate identity within the NHS. 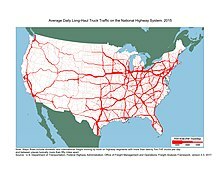 Strategic Highway Network (STRAHNET): The entire network of highways which are important to the United States’ strategic defense policy and which provide defense access, continuity, and emergency capabilities for defense purposes. Major Strategic Highway Network Connectors: Highways which provide access between major military installations and routes which are part of STRAHNET. Intermodal Conectors: Routes which provide access between major intermodal facilities and the other four subsystems making up the NHS. The system includes 4% of the nation's roads, but carries more than 40% of all highway traffic, 75% of heavy truck traffic, and 90% of tourist traffic. All urban areas with a population of over 50,000 and about 90% of America's population live within 5 miles (8.0 km) of the network, which is the longest in the world. ^ National Transportation Library. "Intermodal Surface Transportation Efficiency Act of 1991". National Transportation Library. Retrieved April 2, 2013. ^ Federal Highway Administration. "Interstate FAQ: Why don't you put metric speed and distance signs on the Interstate System?". Celebrating the Eisenhower Interstate Highway System. Federal Highway Administration. Retrieved August 23, 2008. ^ Schienberg, Phyllis (March 6, 1997). "Statement of Phyllis Schienberg, Prospects for Innovation Through Research, Intelligent Transportation Systems, State Infrastructure Banks, and Design-Build Contracting". US Senate Committee on Environment and Public Works. Retrieved July 9, 2012. ^ Natzke, Stefan; Neathery, Mike & Adderly, Kevin (September 29, 2017). "What is the National Highway System?". National Highway System. Federal Highway Administration. Retrieved January 29, 2019. ^ a b c Slater, Rodney E. (Spring 1996). "The National Highway System: A Commitment to America's Future". Public Roads. Washington, DC: Federal Highway Administration. 59 (4). ISSN 0033-3735. Retrieved July 9, 2012. ^ Federal Highway Administration (November 7, 2014). "Chapter 18: Strategic Highway Network (STRAHNET)". Status of the Nation's Highways, Bridges, and Transit: 2004 Conditions and Performance. Federal Highway Administration. Retrieved August 27, 2015. ^ Natzke, Stefan; Neathery, Mike & Adderly, Kevin (April 6, 2018). "Intermodal Connectors". National Highway System. Federal Highway Administration. Retrieved January 29, 2019. ^ Cox, Wendell (January 22, 2011). "China Expressway System to Exceed US Interstates". New Geography. Retrieved July 9, 2012. Wikimedia Commons has media related to National Highway System (United States). Weingroff, Richard F. "Backbone: Creation Of The National Highway System"
This page was last edited on 2 March 2019, at 00:28 (UTC).